“If ya pay peanuts, you get monkeys” – and, with no disrespect to our simian cousins, it’s basically true – in transport as anywhere. You gotta use that money wisely, of course (*cough* bus hubs *cough cough*), but even the best-managed system will be pretty monkeyish if it’s not funded right. So we know Wellington’s public transport system has some great history but, in the 21st century, it is by objective standards, pretty mediocre (even before #bustastrophe). We thought we’d dig into some of the dosh that goes towards public transport in Wellington. 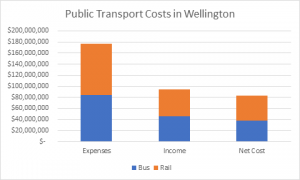 Thanks to a LGOIMA request from funding lobbyist Tony Randle (the man behind WellingtonCommuter), GWRC have released some good information on costs and revenue from different modes. The costs of the bus and rail networks are similar. Overall, $177 million is spent on public transport services in the Wellington region, and $94 million is received in fare revenue. This gives a net cost of $83 million. The net cost of the bus network is only $38 million per year. This may sound like a lot of money. It is, to us lay folk. But let’s look at how that compares to what we spend on road projects and put these numbers into perspective. We’re spending how much on that? Transmission Gully is the most significant roading project under construction in Wellington. There’s no public transport, walking or cycling benefit from Transmission Gully. While there will clearly be some benefits in terms of resilience, this project comes at a high cost: NZTA quoted $850 million. That’s ten times more than public transport costs for running our entire terrestrial public transport network. However, we don’t pay for it all of Transmission Gully upfront. Because of the PPP structure, the private consortium pays the upfront costs of the project (except the $60 million in upfront design, procurement, and planning costs borne by the government) and the government pays the cost over a 25 year period, like a mortgage. According to the NZTA’s own figures, this means that once the project is open, Transmission Gully will cost taxpayers $125 million a year. That’s 50% more than the entire net annual cost of the entire Wellington public transport network. Without tolling, Transmission Gully is expected to carry 22,300 vehicles daily in 2026. Given the toll being talked about is no more than $3, this would only raise a maximum of $24 million per year, or 20% of the annual cost of the project. In reality a $3 toll would likely reduce some traffic using the road (most tolls have this effect), so the revenue could be around $20 million or less. To sum up: we’re arguably spending too much on road building, while we definitely spend far too little on public transport. 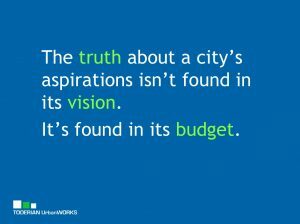 What does this tell us about transport priorities in Wellington? While it could be easy to claim incompetence on the part of GWRC (and many sensible people have), even if we had nothing but exceptional people in charge we would still have a monkey service. The underlying reason our bus network is obviously not meeting our demands is that we don’t spend enough money on it, especially when compared to what we spend on roading projects. Some media complain about the cost of bus hubs increasing by $5 million, and $150,000 a month being spent adding extra capacity to bus routes. While we’re as frustrated as you that the “hubs” are going to be pretty crap (where is GWRC’s and WCC’s TOD thinking?! ), these costs are tiny. It’s like your partner quibbling over $5 on fruit and veges when five minutes ago the household merrily dropped $650 on a fourth TV. The fourth TV may be a beautiful thing – and the peace it brings to the rumpus room may feel lovelier. But let’s not pretend like the extra $5 on fruit and veges is an outrage of fiscal irresponsibility that must be squished out. The bus network delivers values for money and our next post in the series will look at the extra value we’ll get from marginal increases in public transport investment. What sort of bus service would Wellington get if we spend an extra $10, $20 or even $50 million a year? We’re pretty sure the result would be a truly world-class network that would transform our city. So why don’t we? *Note – we can easily have both.